Bo Johnson never thought the latest installment in the Star Wars saga, “The Force Awakens,” would change his life but thanks to his resemblance to British actor John Boyega who plays Finn in the film, he now makes a living as a Mexico City street performer. People now ask to have their picture taken next to 28-year-old Johnson, who works for daily six to seven hour shifts every weekend to pay for his food and lodging expenses, while learning Spanish and enjoying Mexico City’s vibrant culture. Before traveling to Mexico, Chicago-based Johnson, worked in a program to reform juvenile offenders. That was until friends and family back home, started commenting on how much he looked like actor Boyega who plays Finn, a Stormtrooper who deserts when he is sickened by the carnage of the film’s opening military assault on a desert village. It was then that Johnson started to dress as a Stormtrooper, with his first gig during a 2015-2016 New Year’s celebration in Las Vegas. Before his experience in Las Vegas, Johnson had decided to travel to Mexico to learn Spanish. A Mexican friend suggested he could do the same in the middle of Mexico City, where dozens of people make a living by dressing up as famous actors and characters, in exchange for a few pesos. At first, Johnson was unsure how he would attract the attention of pedestrians but within a few hours, he had caused a stir and managed to pocket $3,000 pesos (158 dollars). He places himself on a busy intersection which he shares with a performer dressed as Buzz Lightyear and another as Edward Scissorhands. He eats at cheap eateries, lives in a near-by hotel and during his free time, enjoys walking around the city, socializing and playing basketball. “It’s crazy. I’m living the American dream here in Mexico and it’s kind of funny. I just work on the weekends and have the rest of my day free. I just stay in a hotel. I have the maids clean up for me and stuff like that so. It’s pretty amazing. I just came here to learn Spanish and take “un año tranquilo” (a sabbatical year), a relaxed year and then this opportunity just fell on my lap so. It was a great opportunity so I took it. I’m glad it’s working out,” Johnson said. Based on his successful Mexico City experience working as a Star Wars street performer, he has big plans to repeat his experience in Hong Kong, Sydney, London, Stockholm and Rio de Janeiro. “Me doing it here. It was a good way to launch it out. On Madero, this street, it’s not just Hispanic people here, there’s people from all over the world that visit Mexico City. I’ve met people from Brazil, I’ve met people from Sweden, people from London and they all say that I look like the guy, so that gave me more confidence like: ‘Hey, I can do this over there.’ Some people from Brazil said: ‘Wow, you need to do this in Brazil! You’d make a tonne of money!’ So starting here, meeting people from all over the world. It kind of gave me the confidence like: ‘Hey, I can maybe do this in other places,’ you know?” Johnson added. 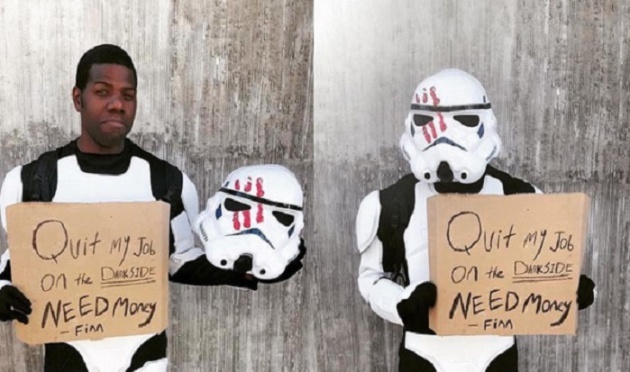 Johnson’s sign reads: “I lost my job on the dark side, I need money: Finn,” which attracted even more trekkies. He is now known on the streets, not only for his disguise, but for his height of 6 foot 5 inches (196 cm) and 230 pound (105 kg) weight, as well as his kindness. His Spanish has improved a great deal and he has even learnt to deal with those who charge street performers for permits in order to let them work. The street performer’s assistant and friend, Miguel Vazquez, explained the secret to Johnson’s success. “It was easy. He’s a foreigner. Apart from being tall, he has good presence, his good-looking, he goes to the gym. He comes from Chicago, he speaks Spanish. The most curious thing is that he looks like the Star Wars character, Finn. He’s just like his clone,” Vazquez said. Based on his success, he invested about $20,000 pesos (1,054 dollars) on more realistic costume, made by a Mexican manufacturer. In time, he said he wants to add different gadgets to it such as lights. But his ambitious plans to do not end in Mexico and as a street performer. Johnson believes his complexion and appearance could help him land a coveted job on a next Star Wars film, working as an extra or double.